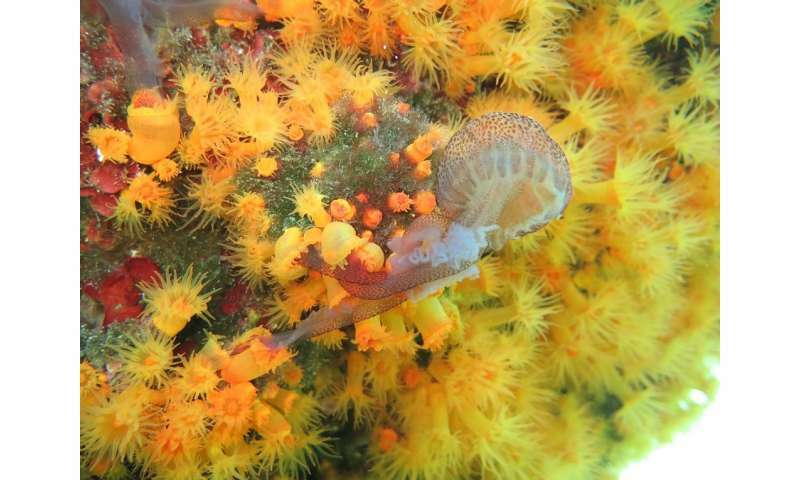 Cave-dwelling corals in the Mediterranean can work alongside one another to catch and eat stinging jellyfish, a study reveals. Observations carried out by the team have revealed how the corals—which feed mostly on tiny marine creatures called plankton—are able to catch such large prey. This coordinated effort to catch prey benefits the coral—a bright orange species called Astroides calycularis—by giving each access to a large meal, the teams says. The jellyfish seen being eaten—called Pelagia noctiluca, or the mauve stinger—is responsible for most of the painful stings people suffer while swimming in the Mediterranean. Fabio Badalementi, Research Director at the Italian National Research Council and Honorary Professor at the University of Edinburgh, said: "Although both species have been known for years, we had no idea that the coral could catch and eat these jellyfish." Professor Murray Roberts, of the University of Edinburgh's School of GeoSciences, said: "This is a really fascinating observation. The conventional wisdom is that corals don't eat jellyfish, but these results show that we need to keep both our eyes and minds open to new discoveries." Video: Should you pee on a jellyfish sting?